A former reporter with a local Chinese daily, Malaysia Daily News, has become a well-known authority on the spread of Christianity and migration of Chinese from southern China to South-East Asia, particularly to Sibu, Sarawak. Wong Meng Lei, 53, has compiled and authored more than 15 books since becoming the chief editor of The Chinese Methodist Message in 1994. He is also respectfully regarded as a historian by both local and foreign researchers and scholars. Question: How long did you work as a reporter? 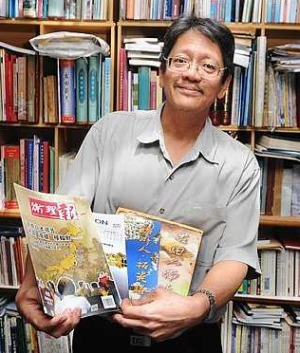 Reporter-turned-author: Wong has more than 15 books to his credit. Answer: Almost 14 years, between 1980 and 1994. Q: What made you quit reporting and join the church? A: Our family has a long association with the Methodist church. My grandfather was a pastor in Fuzhou, China, before serving with the Methodist church in Sibu in the 1920s. I was greatly influenced by my parents who were very faithful Christians and also an elder brother who was once a pastor. Q: Is The Chinese Methodist Message an official publication of the Methodist church and how many copies do you print? A: It is the official Chinese magazine of the church. About 8,600 copies are distributed in Sarawak and Sabah. The inaugural publication rolled out in 1951. We will be celebrating our 60th anniversary this year. A: The Methodist church in Sarawak and Sabah has about 140,000 members. Our own members form the majority of the readers. They can buy the magazine at RM1 a copy or subscribe to it on a yearly basis. Q: You have written many books. What are the contents of these books? A: So far I have published more than 15 books which are mostly related to the history of the early Foochow migration to Sarawak and also the development of Christianity and Methodist church in Sarawak. Two-thirds of the 1,118 early Foochow settlers brought to Sibu by pastor Wong Nai Siong were Christians and the development of modern Sibu after 1901 was in one way or another related to Christianity and the Foochows. Q: What are your latest publications? A: Recently I published two books entitled The Kutien...Nanyang Migration Story and Taste and Flavour of Foochow. The second book which documented all the major Foochow snacks and street food was co-authored with two other writers. Q: I understand that many researchers, historians and scholars have come from many parts of the world to seek your help in their work. What kind of assistance have you provided them? A: I assisted them by providing useful and correct information and statistics. Besides, we have a good collection of history and historical books. The recent examples were a visit by Dr Anne Pang who wrote about her great grandfather Wong Nai Siong and the other was Dr Yamamoto Shin of Tsukuba University who wrote Early Chinese Migration To South-East Asia. I was also invited to give a talk on the history of Sibu at Tsukuba University last month. A: I have been commissioned by Sibu Foochow Association to compile a book on the artworks and artifacts of the Foochows. The book is expected to be published by the end of this year. I hope to publish more history books in future to preserve valuable historical facts for the future generations.